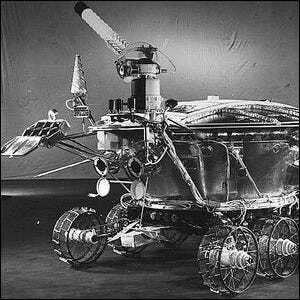 What Was The First Rover To Land On A Celestial Body? Spikes In Electrical Usage During Television Breaks Are Known As? While America beat the Soviet Union in a bid to put a man on the Moon, the Soviets soundly beat the Americans in the race to put a rover on a celestial body. On November 10, 1970, Lunokhod 1 was ferried to the Moon aboard the Luna 17 spacecraft; the launch followed in the footsteps of the failed Lunokhod 0 launch in 1969. Lunokhod 1 was successfully deployed on the Moon seven days later and spent the next ten months sending reports—including soil sample analysis and photographs—back to Earth. The rover relied on a solar cell array to operate during the lunar day and when the sun set on the Moon, plunging the temperatures to a very brisk -238°F, the little rover kept from freezing up thanks to a radioisotope heater unit powered by polonium-210. Lunokhod 1 held the record for the longest functional space rover for over 30 years until it was dethroned by the lengthy service records of the Mars Exploration Rover Mission rovers, Spirit and Opportunity. When America finally put a rover on the Moon, it was part of the later Apollo missions and served as a lunar vehicle for the astronauts to navigate the moonscape in. Thanks to high resolution images from NASA’s Lunar Reconnaissance Orbiter, it’s possible to check out the final resting places of several man-made objects on the Moon including the Lunokhod 1 rover, the Apollo rovers, and various moon landers from both Soviet and American lunar missions. And, even though the primary mission of Lunokhod 1 is long over, the Apache Point Observatory Lunar Laser-Ranging Operation (APOLLO) team from the University of California at San Diego uses the rover as a laser-reflector after, much to their surprise, they found it reflected laser light better than the purpose-built reflectors placed on the Moon.